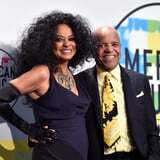 Diana Ross is known for her killer vocals and legendary hits, but she is also known for her big, modern family. The singer is mom to five children from three previous relationships. In 1965, when she was still with the Supremes, Diana began dating Motown CEO Berry Gordy. They were together for several years and even had a child together, Rhonda Suzanne Silberstein, in 1971. When Diana was two months pregnant with Rhonda, she tied the knot with music executive Robert Ellis Silberstein, who was managing her at the time. Aside from Robert raising Rhonda as his own daughter, the couple also welcomed two children of their own, Tracee Ellis Ross and Chudney Ross, in 1972 and 1975, respectively. After nearly six years of marriage, the two divorced in 1977. After briefly dating Gene Simmons in the early '80s, Diana met Norwegian businessman Arne Næss Jr. in 1985. They married the following year and she became a stepmother to his three children, Katinka, Christoffer, and Leona. Following their wedding, Diana and Arne welcomed two sons together, Ross Naess and Evan Ross, in 1987 and 1988, respectively. The two divorced in 2000, and four years later he was tragically killed during a mountain climbing accident in South Africa. Following his death, Diana has stayed close with her former stepchildren and has even referred to Arne as the "love of her life." Today, Diana still remains friends with her exes, Berry and Robert. Berry even supported Diana during her Grammys performance on Sunday night.